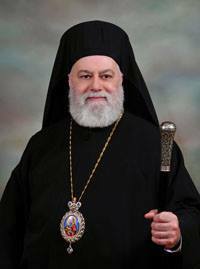 His Eminence Metropolitan Savas was elected as the Metropolitan of Pittsburgh on November 3, 2011. The Metropolitan is a native of Gary, Indiana, the second of six children of Skevos and Stamatia (Georgiades) Zembillas of Kalymnian and Cypriot ancestry. He is a graduate of Andrean High School, Gary, Indiana (1975), Colby College, Waterville, Maine (1979, BA in Philosophy and English Literature) and Holy Cross Greek Orthodox School of Theology in Brookline, Massachusetts (1984, M.Div. with highest honors). He served as the pastoral assistant at Holy Trinity/St. Nicholas in Cincinnati, Ohio from 1985-87 before resuming his academic studies at Oxford University, England, from 1987 until 1994, under the supervision of then Bishop Kallistos (Ware) of Diokleia, researching texts and persons of spiritual significance for the history of early Byzantine monasticism. He was ordained to the Holy Diaconate on November 21, 1992, and on January 8, 1995, to the Holy Priesthood, on both occasions by the then Bishop Iakovos of Chicago, at his home parish of Sts. Constantine and Helen Cathedral in Merrillville, Indiana. During a two-year interim between ordinations, he served as Deacon to Bishop Kallistos of Diokleia. Upon his return to the United States, in September 1995, he was appointed as Proistamenos of the Greek Orthodox Church of the Annunciation in Kalamazoo, Michigan. He was elevated to the rank of Archimandrite on November 12, 1996, and in September 1997, he was assigned to the Greek Orthodox Church of St. Demetrios in Merrick, Long Island. Bishop Savas served as the Chancellor of the Greek Orthodox Archdiocese of America until 2009, when he was named Director of the Archdiocesan Office of Church, Society and Culture.